Would you like to improve the look of a damaged or discoloured tooth with minimal work and preparation? 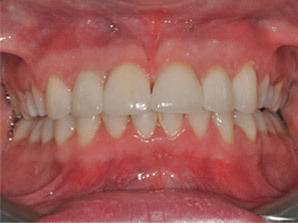 Perhaps you would like to straighten or align a slightly crooked tooth (or teeth) without the use of orthodontics? If so, a dental veneer is an ideal way to quickly, safely and comfortably cover any imperfect teeth allowing you to gain a natural looking attractive smile with the minimum of fuss. A dental veneer is a thin layer of manufactured material which is placed over the front surface of a tooth. Veneers can be used to dramatically change the appearance (including the size, shape, colour and position) of many different teeth. 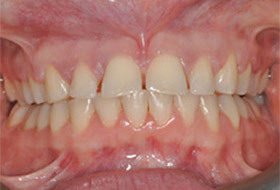 They are usually placed on the front upper and lower teeth. The process is quick and comfortable and requires very little preparation time. 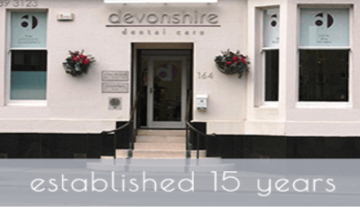 Devonshire Dental Care has the benefit of having our veneers, crowns and dental bridges made on site by a UK renowned Glasgow dental laboratory. We make use of only the best quality, natural looking materials including porcelain and composite to ensure a truly beautiful result you will love. Each patient is different and the length of time required to fit your veneer will depend on your personal circumstances. Normally, we would fit a veneer in around two appointments although this can take longer if you are having more than one fitted. At your initial visit, your tooth (or teeth) will be prepared. 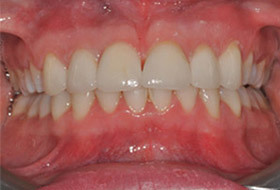 We will need to remove a tiny amount of enamel in order to create space for the veneer to fit on the top of the tooth. This will ensure it sits flush with the existing teeth blending in and feeling just the same as the others. When your tooth is ready, we will take an impression of it so that your veneer can be custom made for you. It will be carefully colour matched to your other teeth. Your brand new veneer will be checked for fit. Once you are happy, it will be attached to the front surface of your teeth with a dental adhesive. It may be necessary for you to attend a follow up visit around a week afterwards to check you are happy and that it has indeed stuck securely. As it is made from a strong and durable material your veneer should last for many years. It’s important to take care of it- be aware of foods and other habits that could potentially damage it. A veneer can be easily chipped or broken by eating very hard foods or chewing fingernails and pens. If it starts to feel loose at any time please contact us straight away. 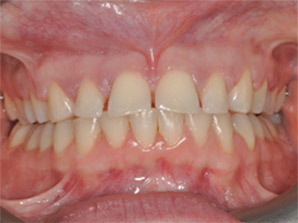 An example of veneers carried out by Allan Rennie.